A 21-year-old, African-American male presented to the emergency department with a stab wound to the left chest. A 2-cm laceration with minimal oozing was noted on the anterior chest wall at the left lower-sternal border. On clinical assessment, the patient was hemodynamically stable and in no acute distress. A chest x-ray obtained at admission showed a normal cardiomediastinal silhouette with no lung or bone lesions. 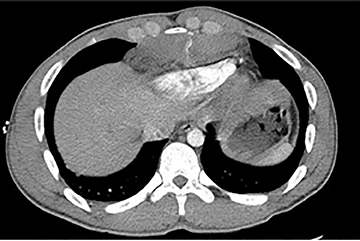 A computed tomography (CT) scan of the thorax with contrast demonstrated a large anterior mediastinal hematoma that was compressing the heart. Within the hematoma, a small region of arterial extravasation from injury to the left internal mammary artery (IMA) was identified. The patient underwent coil embolization of the left IMA to control the hemorrhage and thoracotomy for evacuation of the hematoma. As a ligament injury was suspected to A CT scan of the thorax with contrast demonstrated a large anterior-mediastinal hematoma measuring 11 × 11 × 3.4-cm compressing the left ventricle. A small area of increased density within the hematoma suggested active extravasation of contrast material, indicating vascular injury (Figure 1). No hemothorax, pneumothorax, pleural or pericardial effusions were noted. Bony structures of the thorax were intact, with no evidence of acute fractures or dislocations. A small amount of air presentin the anterior and middle mediastinum was attributed to the stab wound. 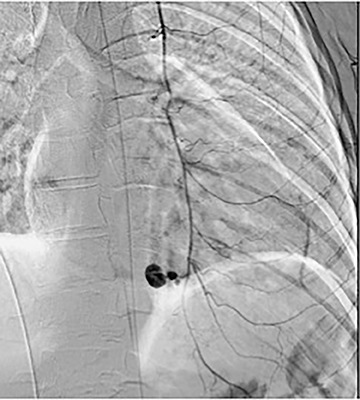 After accessing the right femoral artery with a micropuncture needle under ultrasound guidance, a thoracic aortogram was performed using a 5Fr pigtail catheter. 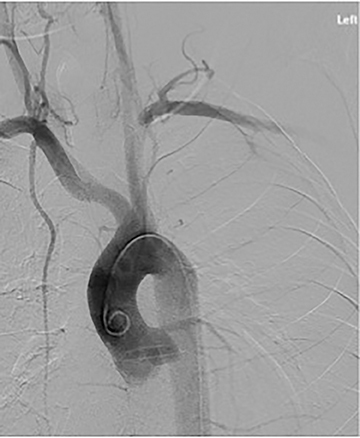 Angiography of the aorta and its branches showed grossly normal vessels (Figure 2). A 5Fr Berenstein catheter was then used to perform a left subclavian arteriogram and an internal mammary artery catheter was used to perform a selective arteriogramo f the left IMA. Both studies demonstrated a focal area of extravasation in the distal left internal mammary artery corresponding to the area of enhancement identified on CT (Figure 3). A 3Fr microcatheter was used to place multiple 3-mm and 4-mm VortX Diamond coils (BostonScientific), both distal and proximal to the site of injury. 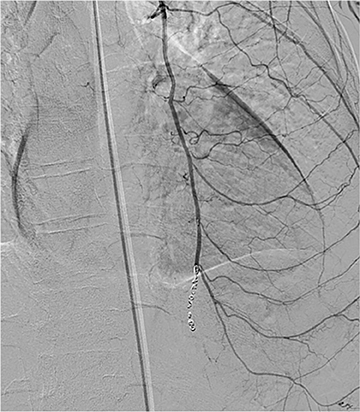 A final arteriogram of the left IMA (Figure 4) showed successful resolution of the pseudoaneurysm with no residual flow. The following day, the hematoma was evacuated via thoracotomy to prevent infection. The patient tolerated the procedures well and there were no postoperative complications. Kwon OY, Chung SP, Yoo IS, et al. Delayed presentation of internal mammary artery rupture after blunt chest trauma: characteristic CT and plain x ray findings. Emergency Medicine Journal. 2005;22:664-665. Cagini L, Vanucci J, Scialpi M, Puma F. Diagnosis and endovascular treatment of an internal mammary artery injury. Journal of Emergency Medicine. 2013;44:117-119. Braatz T et al. CT diagnosis of internal mammary artery injury caused by blunt trauma. Clinical Radiology. 2001;56:120-123. Kawamura S et al. Internal mammary artery injury after blunt chest trauma treated with transcatheter arterial embolization. The Journal of Trauma: Injury, Infection and Critical Care. 2006; 61:1536-1539. Radiological Case: Traumatic injury to the left internal mammary artery. Appl Radiol. Prepared by Dr. Joshi, Dr. Radhakrishnan, Dr. Rotem, and Dr. Bowers while at the Division of Vascular/Interventional Radiology,Medical College of Georgia, Augusta, GA.